Here’s a quick experimental animation I created using program called hype that helps create animations in HTML 5 and CSS3. All things being equal I’d carry on creating animations using Flash but Steve Jobs, in all his infinite wisdom, has taken against Flash for some reason. The end result is that users of iphones and ipads can’t see the animations on my site. The question is, then, can you see this animation okay? If you can (or can’t) please let me know by comment below or by email letting me know which computer and which browser you are using. Thanks! Works in latest Safari and Firefox on my Mac. It works just fine on my iPad (first generation). But… the last tooth to mesh on the wheel on the RHS has its end chopped off, and the axis of the wheel dips up and down three times in the distance it travels from one end to the other. It's visible in Firefox 4.0.1 but the meshing of the gear and rack goes a bit astray when the rack moves to the far right. I'm on PC XP Pro IE8 and I get the same issues as Smelter. Also note the cog renders with a scratchy black circular outline. PC XP Pro Firefox 3.6.16 has issues too – Andy from WorkshopShed describes those accurately. Also note the cog renders with a visible white circular outline — maybe its an anti-aliasing or masking artifact. Some comments above say that they can see it, but at what quality? and what about the accuracy of the animation? Thanks for the feedback everyone, it was very useful! I'll sort out the alignment problems and re-upload the animation. I think Bo is right, for standards sake HTML 5 is the way to go. I'm glad I came across it before I had re-done all the animations in the mechanism section! Animated gifs are fine but the file size is large. I tried exporting the dwell animation from an earlier post and it was over 500k for poor quality output. 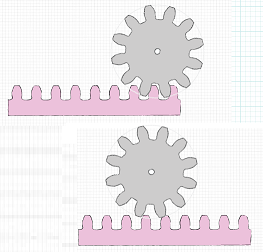 I've been trying to find a way to animate gear systems accuratly, but was unable to find a way to draw the gears with the right number size teeth to interlock correctly. I use Adobe Illustrator to create the graphics for animations.